Rex Hicks got in his 32 Ford Utility Truck to start his rounds inspecting airway beacons and intermediate landing fields located across the desert. It was his job to make sure lamps on the towers worked and that generators that provided power had plenty of gasoline. Pilots depended on these flashing lights to guide their flight across the county at night. At the end of World War I, the U. S. Postal Service took interest in providing airmail service between major urban centers and conducted a test flight from New York to Washington D.C. The test proved a success even though the pilot got lost and landed in Baltimore before finding his way on to Washington. The men who flew airmail during the early years (1920s) earned a well deserved reputation as reckless, adventurous individuals held fast by the thrill of this dangerous enterprise. War surplus single engine biplanes with fabric covered wooden frames were converted to make room for fire proof mailbags. All that a pilot had in front of him was a compass, a turn and bank indicator, and an altimeter. The government started issuing contracts for mail delivery between major cities in 1925. Henry Ford was awarded one for service between Detroit and Cleveland and another for service between Detroit and Chicago. Ford got into the air business and produced the tri-motor aircraft with an engine on each wing and one in the nose. It was the first plane made of metal and the first to fly passengers. Anyone with a stable of fabric covered planes and a few experienced pilots could compete for a contract. Fire proof mail sacks weighing up to 500 pounds were slung into the narrow space behind the pilot. 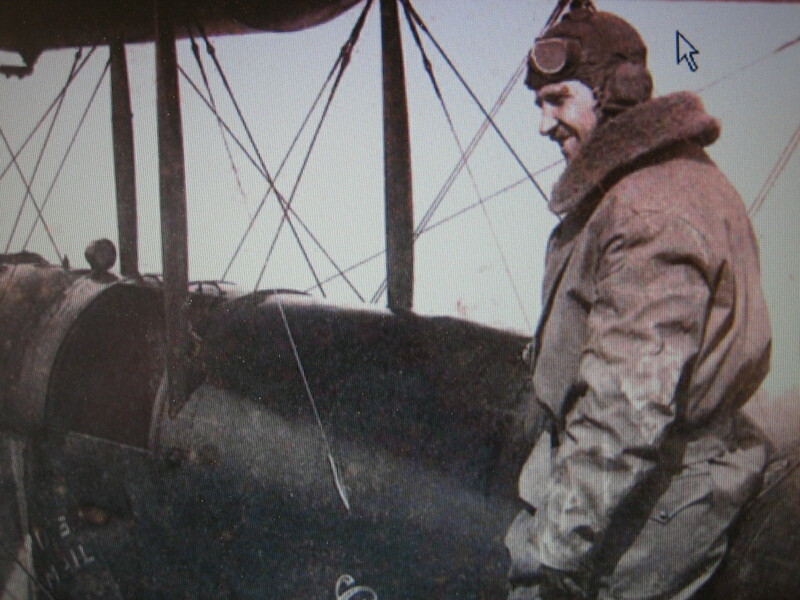 Charles Lindberg flew mail during this time. The first test flight from New York to San Francisco succeeded in cutting two days off delivery by train. In order to beat the rails however, mail had to be continuously on the move. This called for well defined routes or “airways” connecting major cities and light beacons to guide pilots at night. After the successful test flight, airway maps became available showing railroads and other ground features to guide pilots during the day. The placement of light beacons with lamps similar to those in coastal lighthouses began to appear along the New York to San Francisco route spaced up to 20 miles apart. Intermediate and emergency airfields were graded, marked and improved with landing lights and service facilities in addition to a beacon. They were placed at 50 mile intervals. 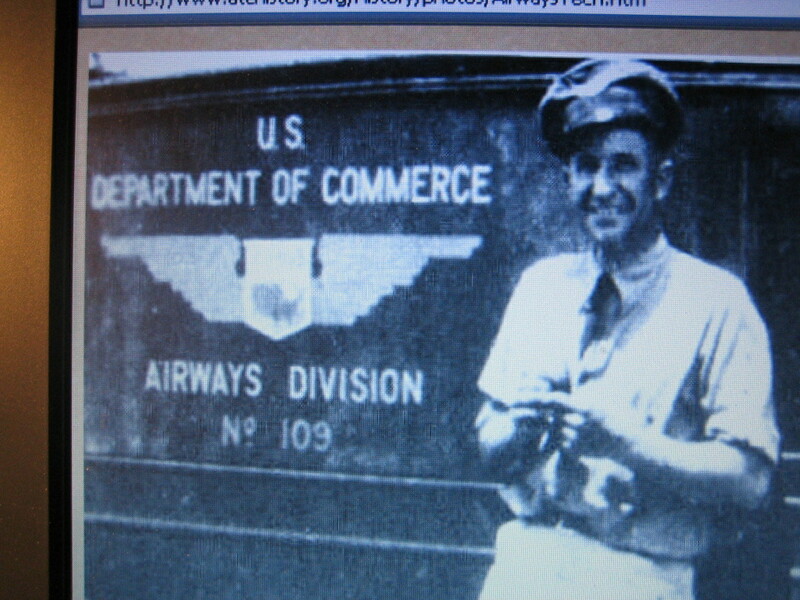 Rex Hicks and other Airway Inspectors played an important part in the system. Beacons were located to maximize visibility. The lantern, mounted on a steel tower, rotated with a flashing beam clear on one side and either green or red on the other. Green indicated landing field with service available. Red indicated no service available. The steel 50 foot towers were attached to a cement base and flanked by a metal shed which housed the gasoline generator. The roof of the shed had a number painted on it that could be seen by pilots in day flight. The 1,000-watt incandescent lamp projected a clear beam of over one and a half million candlepower. Intermediate airfields featured two runways in various configurations with a circle, 50 feet in diameter, near the center of the field. Boundary lights directed night flights to the runways. Weather information and other flight conditions depended on airfield staff. Most fields had shortwave radios and an operator who could gather information from weather stations and pass it along to arriving pilots. 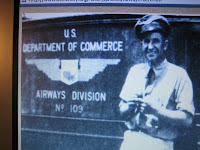 Radio beacons began to appear along airways in the early 30s providing direct ground to air communication with pilots. Ground to air and air to air communication continued to improve and by 1940 air traffic movement and control had reached beyond the need for light beacons. By mid 1970s all of the towers and utility sheds had been removed. Today only access roads and concrete foundations remain. The transcontinental airway system initially connected the east coast with San Francisco following generally the Union Pacific Railroad. Airmail to Los Angeles was forwarded to Los Angeles on the San Francisco to Los Angeles Airway. Routes were later added connecting Los Angeles to Las Vegas and directly to the main transcontinental route via Salt Lake City. By the mid-1930s additional routes were added including Los Angeles to Phoenix and Amarillo, Los Angeles to Tucson and San Diego to Tucson. All of these routes were equipped to move airmail both day and night and ensure deliveries on schedule. The California Desert had its share of beacons and airfields linking Los Angeles and southern California to the above destinations. The first sack of airmail arrived in Los Angeles from Salt Lake City in 1934. Bagdad Emergency Airfield (34 34 52.22383; 115 52 44.87981) Located at the Bagdad Station on south side of Old Highway 66… No service was available. Cadiz Summit (34 44 13.53865; 114 48 28.87752) Located on the hill at the summit north side of Old Highway 66 The cement base can be found a short walk from the highway. Goffs Intermediated Landing Field (34 56; 115 02) one and a half miles NE of Goffs Station. Complete service available. 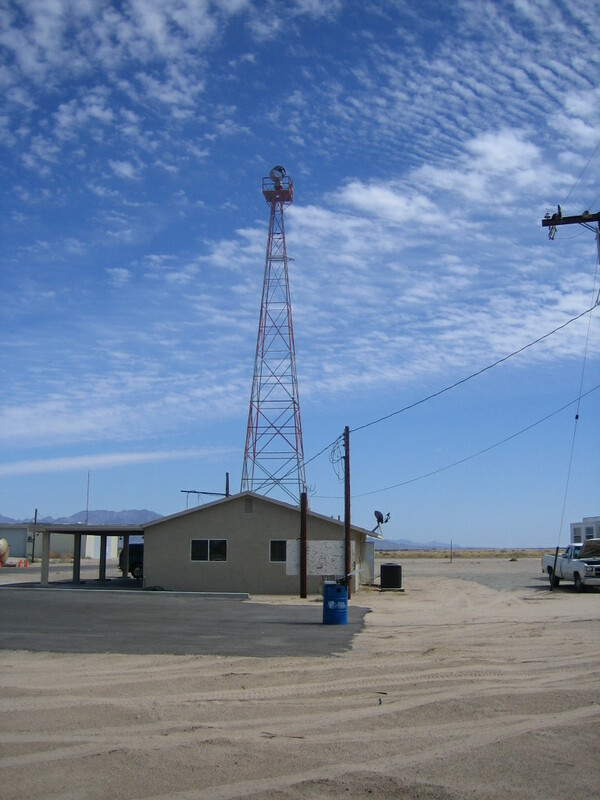 The Desert Center airport many have served as an intermediate airfield in the late 1930s. It has the only remaining beacon tower in the California Desert. (See photograph above).